Since we are Jewish, Christmas day is just another day for us. The only difference is pretty much everything is closed. Thanks to this, we must entertain ourselves at home or with relatives until we get Chinese food for dinner. This year, TechyDad opted to go into work on Christmas and use the vacation day for another occassion. He figured he could get a lot of work done when everyone was out. The boys and I were invited to spend the day with my parents. Nana and Papa made us breakfast. The boys loved their blueberry pancakes. After that, we played for a little while before we all watching the Disney Christmas parade. The boys loved this since they remembered so many of the places that were shown at Walt Disney World. Of course, it left me feeling a little sad. It was just about a year ago now that we officially decided to book a trip to Disney World for May. Ah, the memories. Once the parade was over, the boys played while Nana made lunch. 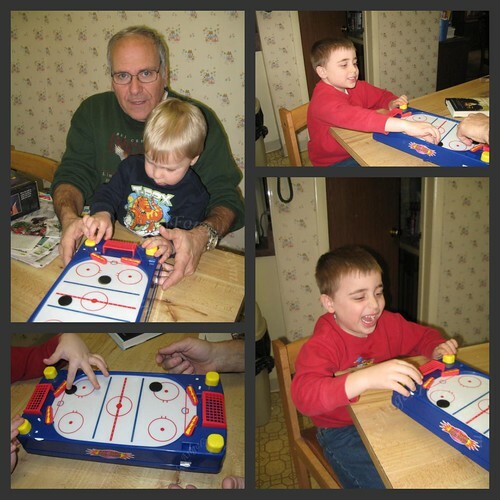 After that, Papa pulled out a hockey game that he had. The boys were pretty intrigued by this. At first they sat at the kitchen table with Papa to play. Soon the boys packed up and moved to the dining room floor. They kept playing here for quite some time. It was hilarious to watch them interact. Everything NHL did, JSL tried it moments later. As fun as this game may be to play, the sounds can certainly grate on adult ears that have to listen for an extended amount of time. Here are the boys playing for a short segment. Please note the number of pucks in use. Eventually, the boys stopped playing and it was time for JSL to show us his new Santa hat wearing technique. 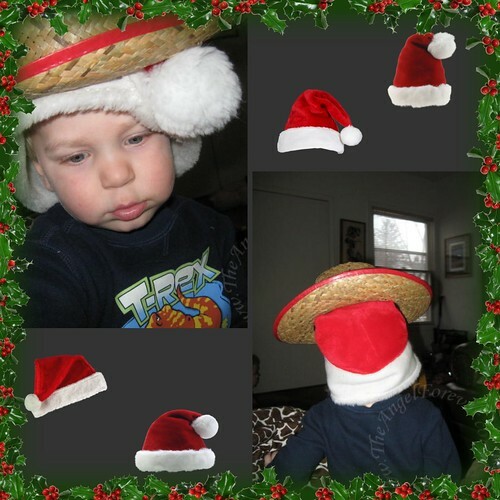 Apparently, he is into the western style of Santa hat wear. At the end of the day, the boys and I packed back up to head home. We met up with TechyDad and opted to order in Chinese food. Then, we had some delicious pie that hubby had gotten from work for being there on Christmas. Yum! Looks like you all had a very nice day. That is an interesting game they created with the hockey game LOL. .-= Robyns Online World´s last blog ..FedEx’s New Out Of Office Blog =-.